Kindergarten literacy activities are an essential component of building student mastery. They also develop ownership of those fundamental reading skills. I want to share one of my FAVORITE kindergarten literacy resources with you. It truly checks all of those boxes necessary for literacy introduction. Often kindergarten practice materials don’t fall in line with the CCSS expectations. Kindergarten materials that require a ton of teacher assistance are frustrating. On the other end of things, many resources do not allow the students to dig a little deeper and strengthen their schema. Daily Kindergarten Literacy Practice is CCSS aligned. Additionally, it spirals and grows in depth and complexity. With 165 pages, it provides a full year of literacy support! Daily Kindergarten Literacy Practice includes a comprehensive teacher guide. The guide outlines the student resource. It provides background support. Additionally, a scope and sequence and pacing outline is included. This is super helpful if you are looking for support activities for specific letters, sounds or skills. 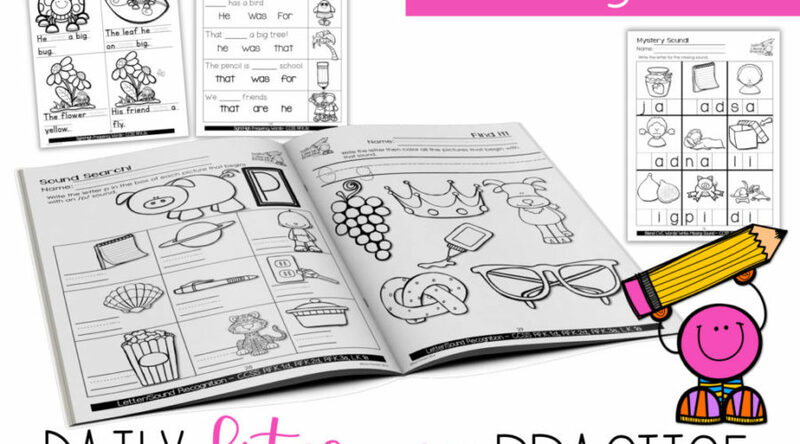 This resource is chock full of kindergarten literacy activities! The initial activities support letter formation mastery. Early readers must work through specific letters in an engaging and meaningful way. It is imperative that students work on skills in real life application, not in isolation. With Daily Literacy Practice, students attach letter formation to their corresponding sounds. The activities are easily used as independent work. Daily Literacy Practice makes fantastic homework, too! There are a ton of phonics activities. Daily Kindergarten Literacy Practice covers all foundational skills essential for beginning readers. Initial, medial and final sounds activities are routine in nature. While growing in depth and complexity, the expectation remains clear and similar. Students can work independently. The work helps build mastery and fluency with sounds and CVC word blending. Because whole language is a huge part of literacy, sight-words are a big part of the Daily Kindergarten Literacy Practice resource. We use these pages along with our Sight Word Hero Series to truly help students achieve and maintain mastery. Again, the expectation and routine is concise, clear and routine. Students are not working on learning a new worksheet each time they work with the resource. The focus remains on the WORDS. This is such a fantastic way to build autonomy and confidence – not to mention STRONG READERS! There’s a first grade version, too! I am obsessed with work that builds slowly, yet effectively! They truly LOVE the independence and get so excited that they are LEARNING!